From the Internet to God's ears, of course. That goes without saying. Does this look Miami or what? Don't get your hopes up. Move Miami up your list. 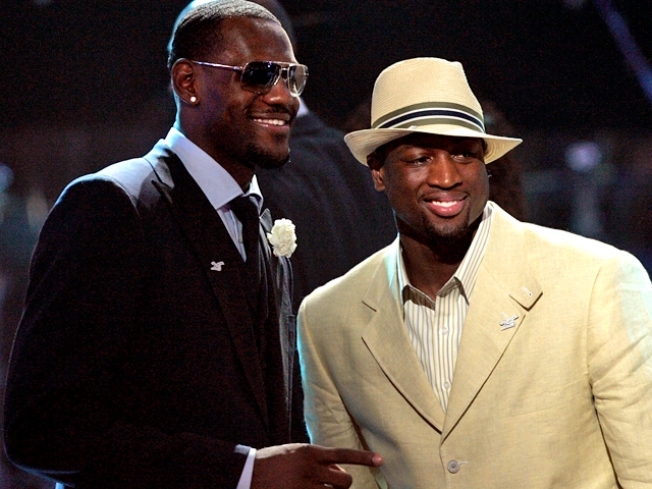 That's the advice I'm getting more and more...Miami's combination of Dwyane Wade, Pat Riley, sufficient cap space to sign one max player and the bonus attraction of South Beach adds up to an offer LeBron might not be able to refuse. The long-held assumption around the league called for Riley -- forever married to the idea that you win nothing without a dominant big man -- to try to sign Bosh away from Toronto to partner with D-Wade, helped along by the fact that Bosh and Wade are both represented by Chicago-based agent Henry Thomas. Yet one source close to the situation told ESPN.com on Thursday night that the theory is outdated. The source is further convinced that Bosh isn't even looking at Miami and that Riley is definitely dreaming of a Wade-and-LeBron combo. You can imagine what happened: this shot across the Internet and exploded in a giant shower of speculation, weeping, and jubilation, depending on geography. Heat fans thought about this combo -- one that could make Jordan-Pippen look pathetic -- realized it didn't not make sense, and shortly needed a cigarette. Then they thought about it again, and flowers bloomed and little cartoon birds sang. It was like Hands Across Miami. But here's the thing: it's November. This story will be retracted and rekindled again at least 8,000 more times, in a billion different incarnations, and none of that will make it any more or less true. There's a lot of time left, and soon you won't even be able to stomach this talk without retching, as you do instinctively upon hearing the word "Favre." Of course, this hullabaloo means something to us, and if it comes to fruition, well, stock up on Champagne and shell out for seats. But in the meantime, take it all with a grain of salt. Something will happen, but we won't know what until July. And that's a long way -- as well as a million and one "inside sources" -- away.